Late last week, Erik Karlsson announced he was purchasing 1,000 letter C's for Sens fans to use to update their Karlsson jerseys now that he had been named team captain. Fans loved the gesture, but veteran defenceman Chris Phillips - whom many believed was a shoe-in for the team's captaincy - responded in a surprising way. Unprompted, Phillips spoke out to the media on Monday, "When I saw Erik's tweet, I thought: 'Hey, he's not the only one who can pull off a stunt like this.' All the fans out there with my jersey deserve to be up to date as well. 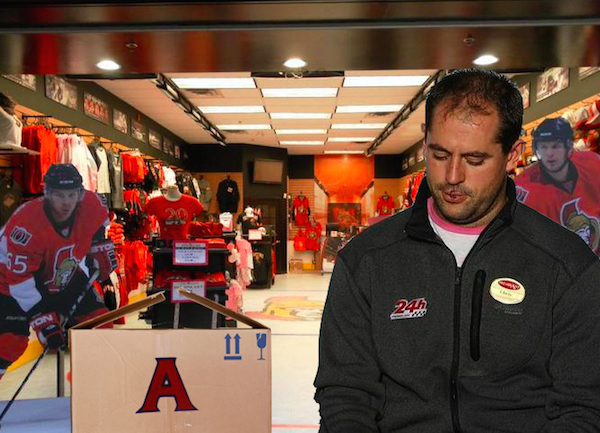 So I went up to manager of the Sens Store and told him I would buy one letter A for every Chris Phillips jersey ever sold. And that's how I ended up with these 28 letter A's." Most of the media thought Phillips was done speaking, but he continued, "I think the real question here is: what kind of a captain even does something like this? It seems a little showy-offy to me. It's like, we all get it. You're the captain. Good for you. But have you guys seen his hair? Way too long to be a captain." Phillips then went on for five minutes about how he's never seen another captain in the NHL with hair like that and that someone should look into whether or not it's allowed. Addressing no one in particular, Phillips continued, "Oh, I almost forgot, here's something your captain never did for you. I've also bought - with my own money - a dozen number 4's for real Sens fans to affix to whatever type of clothing they want. 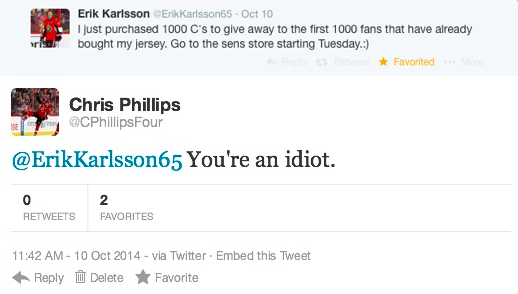 Look, it fits right on top of any other number..." Phillips then showed embarrassed bystanders how it looked on top of the 65 of a Karlsson jersey before the Sens Store manager asked him to stop. Exasperated, Phillips sat down on a very small box of A's. "I get that he's the new captain of the team and that's fine. At this point, we all need to make the best of it. That's why I am pleased to announce the Welcome New Captain promotion at Big Rig. All you have to do is trade in your number 65 Captain Hair jersey, and you will receive a case of Big Rig beer of your choice. Does the captain of the Ottawa Senators have his own brewery? Nope, but what he does have is a weird moustache." "I'm not bitter," Phillips concluded. "But you know what is bitter? Lon's Extra Special Bitter available exclusively at Big Rig, which is definitely a part of our Welcome Dumb Baby Captain promotion!"